Turkey hunting is fun. And extremely challenging — contrary to what some folks would have you believe. I know, I know: There’s an entire library of YouTube videos out there showing wild turkeys chasing dogs, cats, people and even cars, but those are freak, isolated cases. One guy told me he thinks turkeys are dumber than a sack of pickles because of the flock that hangs out in his yard every spring. He says they tear up his lawn scratching for worms, eat the food he puts out for his chickens and then, adding insult to injury, poop all over his pickup truck parked in the driveway under the cottonwood tree they roost in at night. He says they’re so stupid he could easily kill one with a stick. They might be rude, but they aren’t stupid. They’re pretty smart, if you ask me. Smart enough to hide out on his land come turkey season, steal the cracked corn and kitchen scraps meant for his chickens, raid his lawn for bugs and roost in his big, comfy cottonwood every night. Free food, a convenient place to roost and guaranteed security from hunters — what more could they want? To show their appreciation, they “fertilize” his truck. Ya gotta wonder who the real dummy is here. Ok, whacking a crazy urban gobbler with a stick on your front lawn might be possible, but actually calling a wild one to within range of your bow or shotgun during legal hunting season is a whole other matter. A turkey in the wild is an incredibly wary bird and spookier than an 80-year-old hermit. Wild turkeys have eyes that can focus in opposite directions simultaneously, can detect danger in a zone 300 degrees around them and are suspicious of just about everything but themselves. It can be done, but trying to sneak up on one is all but impossible. The most likely way to bag a wild gobbler is to lure one from the flock early in the morning after he flies down from the roost, but before he takes up with the hens. First, of course, you have to find the turkeys. Experienced hunters typically scout back roads late in the day trying to locate active turkey roosts. They may use a crow, coyote or owl call to shock a roosting tom into gobbling and giving away his location, then return early the next morning to set up an ambush nearby. They sneak into the woods well before daylight; conceal themselves in understory brush or erect a small, portable pop-up blind; and wait for the turkeys to fly down from the roost. 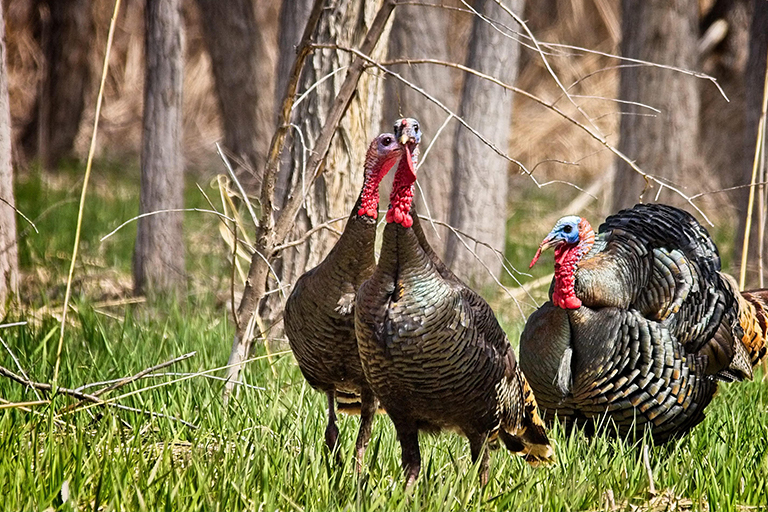 Once the turkeys are on the ground, the hunter will start calling, using a mouth or hand call to lure a big tom away from the flock of lovesick hens. Sometimes, one will leave his harem to investigate. Most of the time they won’t. They’re not that stupid.